Fuchs, Christian. 2018. 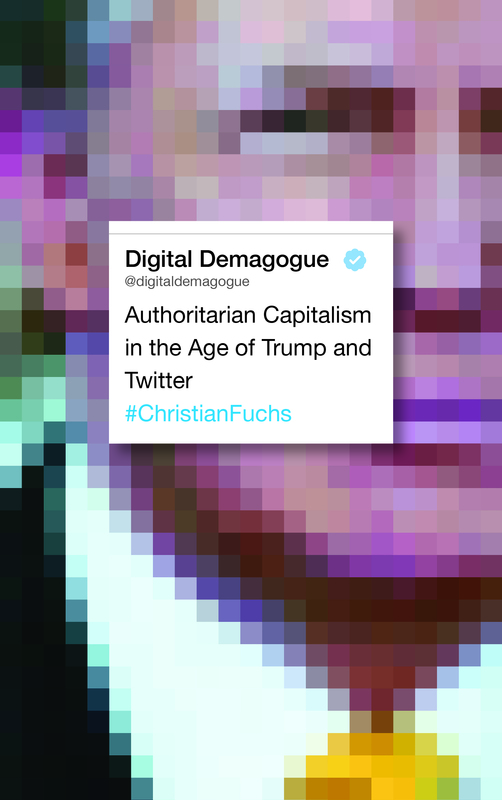 Digital Demagogue: Authoritarian Capitalism in the Age of Trump and Twitter. London: Pluto. 336 pages. Paperback ISBN: 9780745337968. Hardcover ISBN: 9780745337982. eBook ISBN: 9781786802828. From ‘Covfefe’ to #FraudNewsCNN and #FakeNews, Donald Trump’s tweets have caused an international frenzy. He is a reality TV and Twitter-President, who uses digital and entertainment culture as an ideological weapon – as an expression of his authoritarianism. This book delves into new political-economic structures as expressed through political communication to explain the rise of authoritarian capitalism, nationalism and right-wing ideology throughout the world. Christian Fuchs does this through updating Marxist theory and the Frankfurt School’s critical theory. 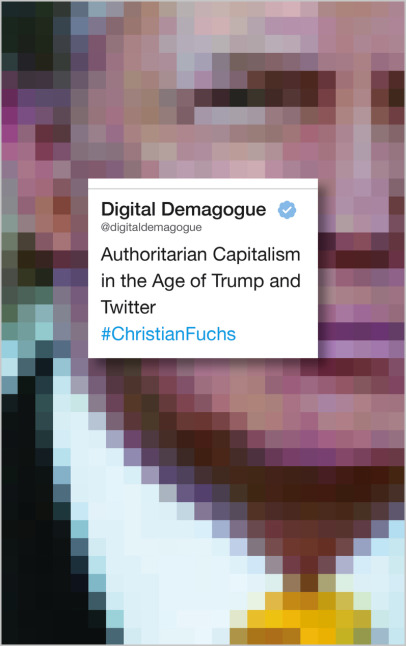 He re-invigorates the works on authoritarianism of Franz L. Neumann, Theodor W. Adorno, Erich Fromm, Herbert Marcuse, Max Horkheimer, Wilhelm Reich, Leo Löwenthal and Klaus Theweleit in the age of Trump and Twitter. Christian Fuchs is a leading critical theorist of communication and society. He is a Professor at the University of Westminster, co-editor of the open access journal tripleC: Communication, Capitalism and Critique, and the author of Digital Demagogue (Pluto, 2018) and Social Media: A Critical Introduction (Sage, 2017) amongst other works. Why There Are Certain Parallels Between Joachim C. Fest’s Hitler-Biography and Michael Wolff’s Trump-Book. Academic version from tripleC 16 (1): 260-263, popular science version from Medium.com, February 14, 2018. This book asks: What is authoritarian capitalism? How is authoritarian capitalism communicated through social media? It formulates foundations of a contemporary critical theory of right-wing authoritarianism and authoritarian capitalism. For doing so, it updates the Frankfurt School’s critical theory of authoritarianism. It draws on and re-invigorates the works of the Frankfurt School thinkers Franz L. Neumann, Theodor W. Adorno, Erich Fromm, Herbert Marcuse, Max Horkheimer and Leo Löwenthal. It studies how right wing authoritarianism works and is communicated on social media platforms such as Twitter and Facebook. Chapter II gives an introduction to the notions of ideology, nationalism an fascism from a critical theory perspective. Chapter III provides a theoretical framework for understanding right-wing authoritarianism and authoritarian capitalism. Chapters IV and V analyse economic power, state power and ideological power in the age of Donald Trump with the help of critical theory. They apply the critical theory approaches of thinkers such as Franz L. Neumann, Theodor W. Adorno and Erich Fromm. Chapter IV focuses on aspects of political economy (Trumpism: Trump and authoritarian statism), chapter V on Trump’s ideology (Trumpology). Chapter V focuses on the ideology of Trump (Trumpology). Trumpology has played an important role not just in Donald Trump’s business and brand strategies, but also in his political rise. The (pseudo-)critical mainstream media have helped making Trump and Trumpology by providing platforms for populist spectacles that sell as news and attract audiences. By Trump making news in the media, the media make Trump. An empirical analysis of Trump’s rhetoric and the elimination discourses in his NBC show The Apprentice underpins the analysis of Trumpology. The combination of Trump’s actual power and Trump as spectacle, showman and brand makes his government’s concrete policies fairly unpredictable. An important question that arises is what social scientists’ role should be in the conjuncture that the world is experiencing.